The IWC Aquatimer Chronogaph is the real deal when it comes to diving watches. It has a unidirectional inner bezel and SafeDive system, and its chronograph function can even be used underwater. The timepiece is waterproof to 300 m (30 bar). The IWC Aquatimer Chronograph follows in the tradition of the first IWC diving watch from 1967. The SafeDive System, which is comprised of an inner and outer bezel, ensures that you can only move the inner bezel counterclockwise. The inner bezel indicates how much time has passed and therefore, you can only ever shorten your dive time if the bezel is accidentally moved. The outer bezel is bidirectional. Thanks to its design, it has an especially good grip and is easy to use even while wearing diving gloves. The chronograph displays the date and day at three o'clock. In addition to the SafeDive System, the watch can time up to 12 hours with its stopwatch function. 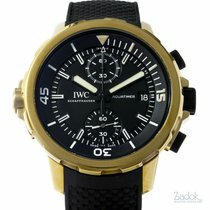 The International Watch Company (IWC) has about 50 years of experience with diving watches. 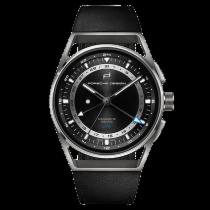 The luxury manufacturer introduced the first Aquatimer in 1967. The watch could withstand pressure up to 20 bar and featured a rotatable inner bezel. Usually, diving watches have a unidirectional bezel which rotates counterclockwise, such as the Rolex Submariner, one of the first diving watches ever created. The 1967 Aquatimer, however, featured a second inner bezel under the watch glass. It was controlled via a crown on the right side of the case. Are you looking for a robust diving watch with a stopwatch function? Then the IWC Aquatimer Chronograph is the perfect timepiece for you. The stopwatch push-pieces function underwater, unlike many other chronographs. The stopwatch function on most chronographs should not be used underwater, as water can get into the case if you press a push-piece. 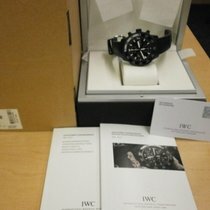 A pre-owned IWC Aquatimer Chronograph costs around 3,000 euros. New models cost around 4,500 euros, while pre-owned titanium models cost around 4,000 euros. You should plan to spend around 5,000 euros on a new titanium Aquatimer Chronograph. Currently, bronze watches are trendy. The bronze version of this watch costs around 7,000 euros and since it's a relatively new model, there are very few pre-owned models available. Models made of 18-karat gold are particularly eye-catching. An IWC diver chronograph made of red gold costs around 15,000 euros. An alternative to the IWC diver chronograph is the Aquis Chronograph from the Swiss manufacturer Oris. The 46-mm diving watch is waterproof to 500 m (50 bar). You have the choice between a link stainless steel bracelet or a rubber strap. New models with a rubber strap start at 2,300 euro. 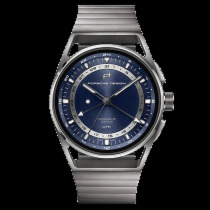 Models with a stainless steel bracelet cost a little more at 2,400 euros. The current IWC Aquatimer Chronograph model (reference number 3768) is only available in stainless steel. Earlier models of this diver chronograph were made of solid gold or titanium. The watch has a diameter of 44 mm, making it perfect for larger wrists. The watch is waterproof to 30 bar (300 m). 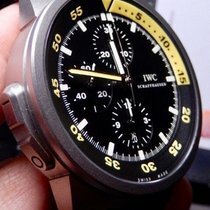 Current IWC Aquatimer Chronograph models have black or silver dials. The day/date display is located at three o'clock. The 30-minute counter is at 12 o'clock while the 12-hour counter is at six o'clock; the small seconds is at nine o'clock. The silver dial model has striking yellow hands on the small seconds, and the top of the stopwatch seconds hand is also yellow. The hands and indices on the dial are coated with a brightly glowing luminous material. The inner bezel also has markers which glow brightly in the dark. This way, you can keep track of the time and your dive time while underwater. The SafeDive System guarantees that you won't accidentally turn the inner bezel in the wrong direction. 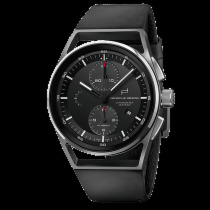 The chronograph's sapphire glass is domed and anti-reflective on both sides. The IWC Aquatimer Chronograph has a very unique strap system, which IWC calls the IWC bracelet quick-change system. It allows you to switch the stainless steel bracelet with another band, such as a rubber strap, without requiring any additional tools. Usually, special watchmaking tools are needed to switch out a band. The IWC Aquatimer Chronograph is powered by the caliber 79320. This movement also powers the IWC Pilot's Watch Chronograph in the Pilot collection. The movement has a 44-hour power reserve and is considered especially robust, precise, and reliable. Thanks to its stop-seconds mechanism, you can set the watch to the exact correct second. The caliber is based on the ETA Valjoux 7750, which can be found in scores of luxury chronographs. 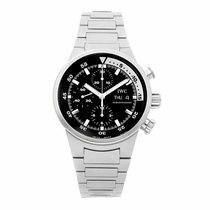 It's one of the most successful automatic chronograph calibers of all time. IWC features several special editions of the Aquatimer Chronograph. One highlight is the Expedition Charles Darwin. This model pays homage to Darwin's expedition ship, the HMS Beagle. Bronze has been traditionally used for metal fittings and nautical instruments, as the material is particularly saltwater-resistant. The Aquatimer Chronograph Expedition Charles Darwin is the first IWC watch to feature a bronze case. Over time, the bronze develops a patina, giving the watch a distinctive look. 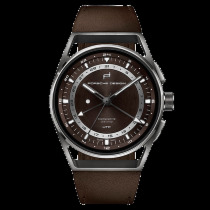 One special feature of the Expedition Charles Darwin is its in-house caliber 89365. The automatic movement has a chronograph function, date display, and 68-hour power reserve. The small seconds is located at six o'clock while the 60-minute counter is at 12 o'clock. The date is in the usual position at three o'clock. Thanks to the stop-seconds mechanism, you can synchronize the watch to the exact second with a time signal. Like the standard version, this bronze IWC watch features the SafeDive System. The crown and push-pieces have a rubber coating and therefore a good grip. The watch's strap is also made out of rubber and a portrait of Darwin adorns the case back.